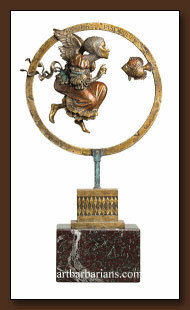 Purchase James Christensen Art Prints online from ArtBarbarians.com located in Minnesota. Rarely does an artist capture and image for a point of view in more than one medium, but that is the case with James Christensen art prints and sculpture. There is a whimsical feeling to his paintings and artwork that goes beyond traditional fantasy. It captures the human emotion while retaining the feeling of another world. These beautiful pieces of art have an appeal to the person who wants something more than a traditional artwork, going beyond to reflect some of the mystery that is within us all. Capturing a fantasy moment is something that can be difficult, in fact it's probably the hardest part of the artistic dream. There are so many ways to explain a moment and with art it goes beyond the mechanics and the technical expertise into the heart of each person who sees it. This artist brings out those feelings of a far away places and adventure that we feature here on our web site. We have a couple of examples of this fine artist's work. You get a sense the time in his art and an excellent way of color which is hard to describe. 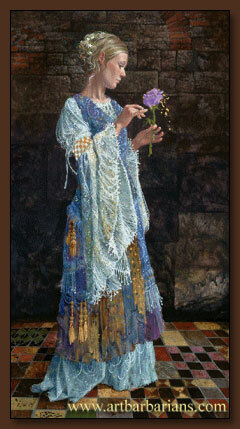 James Christensen art prints have been well the world over and have a timeless quality to them. Inspired by the world's myths, fables and tales of imagination, James C. Christensen wants his work to add up to more than a beautiful - if sometimes 'curious' looking work of art. Having taught art professionally for over 20 years, he likes to think of the world as his classroom. His hope is that through whatever he creates "be it a porcelain, fine art print or book" he can convey a message, inspiration or a simple laugh. He believes that teaching people to use their imagination helps us find solutions to sooth the stresses of everyday life - or get a little lift to help us keep going. In short: all things are possible when you share Christensen's philosophy that "Believing is Seeing." You may want to browse our James Christensen art prints and sculpture and you'll find that our general selection of paintings is one of the deepest on the Internet, with many artists listed here. We're adding new paintings and prints everyday, after that you may want to move onto our original paintings area which will give you an idea of the depth of the art we carry. It's exciting to be a part of an offering which brings people such a sense of satisfaction and joy. We have many personal relationships with many of these artists that we exhibit and sell, and they trust us to portray their art in a correct manner. Those relationships give us the advantage of getting you some of the best new art first, so you can add to your collection before what you want is gone. Call us if you have any questions about anything you see on our web site or need to know more about James Christensen art prints. We're happy to answer your questions personally regarding availability or something special you're looking for.